Yes, the Swarovski Optik “Fabulous EL Fifties” won the Great Texas Birding Classic 5-Day Event with an approved list of 312 species! Believe me, the team gutted out every one of those birds. Considering that the 2nd place team tallied 306 species, the Swaro team’s infernal bird-spotting energy and endurance paid off. Congratulations to all! Somehow, I got the impression that the Swaro team went by its usual moniker, the Roadside Hawks. However, the auspicious new name makes perfect sense in light of the quality of the awesome EL50 Swarovisions the team employed in the field. Having brought them to bear myself, I can vouch that they are as awesome as you’ve been told! Feel free to congratulate the worthy victors here and everywhere else you find them. Also, stay tuned to more details of what it took to see so many freaking birds in just 5 days as well as how Swarovski Optik will allocate its winnings to support conservation projects along the mighty Great Texas Coastal Birding Trail. B. You are all crazy. I was wondering who won. 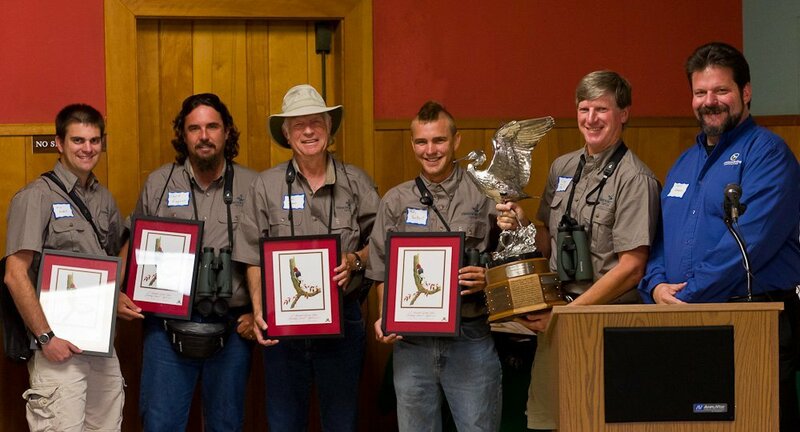 Must have been a memorable and wonderfully grueling five days of birding! Donna, thanks for asking but I barely survived 2.5 days of their birding rampage. Once the team had about 260 birds on the list, I turned them loose and flew back to Rochester!